Glycogen storage disease type IV (GSD IV), or Andersen disease, is an autosomal recessive inborn error of metabolism that is caused by mutations in the gene-encoding glycogen-branching enzyme, which is necessary for normal glycogen production. Decreased activity causes results in the accumulation of amylopectin-like polysaccharide (polyglucosan) in tissues, particularly liver and muscle. [1, 2, 3] A glycogen storage disease (GSD) is the result of an enzyme defect. 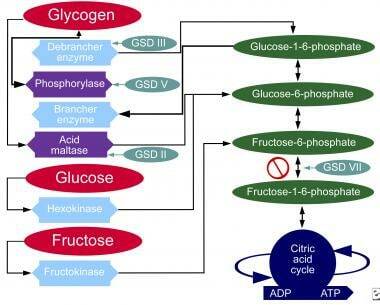 These enzymes normally catalyze reactions that ultimately convert glycogen compounds to glucose. Enzyme deficiency results in glycogen accumulation in tissues. In many cases, the defect has systemic consequences, but in some cases, the defect is limited to specific tissues. Most patients experience muscle symptoms such as weakness and cramps, although certain GSDs manifest as specific syndromes, such as hypoglycemic seizures or cardiomegaly. Clinically, hepatosplenomegaly, cirrhosis of the liver, and hepatic failure are major concerns. History is not specific for GSD IV. Patient complaints probably relate to end-organ injuries of Andersen disease, such as hepatic failure, cardiomyopathy, or muscular atrophy. Hypoglycemia is rarely seen. Adults may present with central and peripheral nerve dysfunction. Sansone and colleagues report a distinct periodic paralysis of either hypokalemic or hyperkalemic type. [5, 6] Ventricular arrhythmia may occur. Diagnosis depends on patient history and physical examination, muscle biopsy, electromyelography, ischemic forearm test, and creatine kinase level. Biochemical assay for enzyme activity is the method of definitive diagnosis. Obtain a creatine kinase level in all cases of suspected GSD. Because hypoglycemia may be found in some types of GSD, fasting glucose testing is indicated. Urine studies are indicated because myoglobinuria may occur in some GSDs. Liver function studies are indicated and may reveal evidence of hepatic injury. Glycogen structure is altered, with fewer branching points and longer peripheral chains. This abnormal glycogen structure is absent in other GSDs. Imaging may reveal hepatosplenomegaly, cardiomyopathy, or heart failure. Liver biopsy may be needed to determine the cause of progressive liver dysfunction. Histologic findings are characteristic in the liver, with diffuse interstitial fibrosis, wide fibrous septa, and enlarged hepatocytes with periodic acid-Schiff positive inclusions. Electron microscopy shows alpha and beta glycogen particles. Diffuse deposition of amylopectin-like materials in the heart, liver, muscle, spinal cord, and peripheral nerves may be present. Unfortunately, no specific treatment or cure exists, although diet therapy may be highly effective at reducing clinical manifestations. In some cases, liver transplantation may abolish biochemical abnormalities. Meticulous adherence to a dietary regimen may reduce liver size, prevent hypoglycemia, reduce symptoms, and allow for growth and development. Although at least 14 unique GSDs are discussed in the literature, the 4 that cause clinically significant muscle weakness are Pompe disease (GSD type II, acid maltase deficiency), Cori disease (GSD type III, debranching enzyme deficiency), McArdle disease (GSD type V, myophosphorylase deficiency), and Tarui disease (GSD type VII, phosphofructokinase deficiency). One form, von Gierke disease (GSD type Ia, glucose-6-phosphatase deficiency), causes clinically significant end-organ disease with significant morbidity. The remaining GSDs are not benign but are less clinically significant; therefore, the physician should consider the aforementioned GSDs when initially entertaining the diagnosis of a GSD. Interestingly, GSD type 0, which is due to defective glycogen synthase, is also recognized. Transglucosidase, which is found in all tissues, is deficient. The condition is autosomal recessive. Due to abnormal glycogen, hepatic deposition may occur and result in severe cirrhosis, hepatic failure, or neuromuscular failure. It also can present as abnormal liver function tests in its mildest presentation. Cardiac and skeletal muscle may show PAS+ eosinophilic cytoplasmic inclusions. Lamperti et al noted a novel mutation in an infant who died at age 1 month of cardiorespiratory failure. The branching enzyme gene sequence was found to contain a homozygous nonsense mutation, p.E152X, in exon 4, that correlated with a virtual absence of branching enzyme biochemical activity in muscles and fibroblasts, as well as with a complete absence of such activity in the liver and heart. The infant presented with symptoms consistent with congenital GSD IV, including severe hypotonia, dilatative cardiomyopathy, mild hepatopathy, and brain lateral ventricle hemorrhage. Muscle, heart, and liver specimens contained numerous vacuoles filled with PAS+ diastase-resistant materials, while electron microscopy revealed polyglucosan accumulations in all of the examined tissues. Polyglucosan was also found in vacuolated neurons. Serious morbidities include hepatic failure, hepatosplenomegaly, and cardiomyopathy (less frequent). In general, GSDs present in childhood. Later onset correlates with a less severe form. Liver failure may occur in the first 5 years of life due to deposition of glycogen. Severe hepatic failure with possible malignant transformation results in death in childhood, usually by the second year. Schene IF, Korenke CG, Huidekoper HH, van der Pol L, Dooijes D, Breur JMPJ, et al. Glycogen Storage Disease Type IV: A Rare Cause for Neuromuscular Disorders or Often Missed?. JIMD Rep. 2019. 45:99-104. [Medline]. Sandhu T, Polan M, Yu Z, Lu R, Makkar A. Case of Neonatal Fatality from Neuromuscular Variant of Glycogen Storage Disease Type IV. JIMD Rep. 2019. 45:51-55. [Medline]. Magoulas PL, El-Hattab AW, Adam MP, Ardinger HH, Pagon RA, Wallace SE, et al. Glycogen Storage Disease Type IV. 1993. [Medline]. [Full Text]. Froissart R, Piraud M, Boudjemline AM, Vianey-Saban C, Petit F, Hubert-Buron A, et al. Glucose-6-phosphatase deficiency. Orphanet J Rare Dis. 2011 May 20. 6:27. [Medline]. [Full Text]. Sansone V, Griggs RC, Meola G. Andersen''s syndrome: a distinct periodic paralysis. Ann Neurol. 1997 Sep. 42(3):305-12. [Medline]. Szymańska E, Szymańska S, Truszkowska G, Ciara E, Pronicki M, Shin YS, et al. Variable clinical presentation of glycogen storage disease type IV: from severe hepatosplenomegaly to cardiac insufficiency. Some discrepancies in genetic and biochemical abnormalities. Arch Med Sci. 2018 Jan. 14 (1):237-247. [Medline]. Hogrel JY, Janssen JBE, Ledoux I, Ollivier G, Béhin A, Stojkovic T, et al. The diagnostic value of hyperammonaemia induced by the non-ischaemic forearm exercise test. J Clin Pathol. 2017 Oct. 70 (10):896-898. [Medline]. Bruno C, van Diggelen OP, Cassandrini D, et al. Clinical and genetic heterogeneity of branching enzyme deficiency (glycogenosis type IV). Neurology. 2004 Sep 28. 63(6):1053-8. [Medline]. Janecke AR, Dertinger S, Ketelsen UP, et al. Neonatal type IV glycogen storage disease associated with "null" mutations in glycogen branching enzyme 1. J Pediatr. 2004 Nov. 145(5):705-9. [Medline]. Fernandez C, Halbert C, De Paula AM, et al. Non-lethal neonatal neuromuscular variant of glycogenosis type IV with novel GBE1 mutations. Muscle Nerve. 2009 Oct 7. [Medline]. Nolte KW, Janecke AR, Vorgerd M, et al. Congenital type IV glycogenosis: the spectrum of pleomorphic polyglucosan bodies in muscle, nerve, and spinal cord with two novel mutations in the GBE1 gene. Acta Neuropathol. 2008 Nov. 116(5):491-506. [Medline]. Lamperti C, Salani S, Lucchiari S, et al. Neuropathological study of skeletal muscle, heart, liver, and brain in a neonatal form of glycogen storage disease type IV associated with a new mutation in GBE1 gene. J Inherit Metab Dis. 2009 Apr 8. [Medline]. Magoulas PL, El-Hattab AW, Adam MP. Glycogen Storage Disease Type IV. Adam MP, Ardinger HH, Pagon RA, et al.,. GeneReviews. January 3, 2013. University of Washington, Seattle: 1993. [Full Text]. Shen J, Liu HM, McConkie-Rosell A. Prenatal diagnosis of glycogen storage disease type IV using PCR-based DNA mutation analysis. Prenat Diagn. 1999 Sep. 19(9):837-9. [Medline]. Akman HO, Karadimas C, Gyftodimou Y, Grigoriadou M, Kokotas H, Konstantinidou A. Prenatal diagnosis of glycogen storage disease type IV. Prenat Diagn. 2006 Oct. 26(10):951-5. [Medline]. Ewert R, Gulijew A, Wensel R. [Glycogenosis type IV as a seldom cause of cardiomyopathy - report about a successful heart transplantation]. Z Kardiol. 1999 Oct. 88(10):850-6. [Medline]. Aminoff MJ. Electromyography in Clinical Practice. 3rd ed. New York, NY: Churchill Livingstone; 1998. Bao Y, Kishnani P, Wu JY. Hepatic and neuromuscular forms of glycogen storage disease type IV caused by mutations in the same glycogen-branching enzyme gene. J Clin Invest. 1996 Feb 15. 97(4):941-8. [Medline]. Chan YJ, Lin SP, Chen BF. Glycogen storage disease type IV: a case report. Chung Hua I Hsueh Tsa Chih (Taipei). 1999 Oct. 62(10):743-7. [Medline]. Giuffre B, Parinii R, Rizzuti T, et al. Severe neonatal onset of glycogenosis type IV: clinical and laboratory findings leading to diagnosis in two siblings. J Inherit Metab Dis. 2004. 27(5):609-19. [Medline]. Selby R, Starzl TE, Yunis E. Liver transplantation for type I and type IV glycogen storage disease. Eur J Pediatr. 1993. 152 Suppl 1:S71-6. [Medline]. Selby R, Starzl TE, Yunis E. Liver transplantation for type IV glycogen storage disease. N Engl J Med. 1991 Jan 3. 324(1):39-42. [Medline]. Takahashi T, Tandai S, Toki T, et al. KCNJ2 mutation in intractable ventricular arrhythmia with Andersen's syndrome. Pediatr Int. 2005 Apr. 47(2):220-3. [Medline].